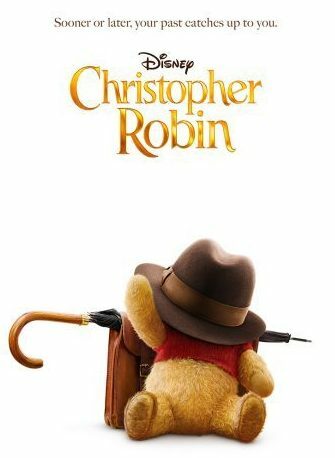 A grown-up and stressed-out Christopher Robin is revisited by his childhood friend, Winnie the Pooh, and returns to Hundred Acre Wood to reignite his imagination, and rediscover the joy and whimsy he had as a child. This is the basic premise of this movie. Taking a much loved character, and placing them in a grown-up reality, is a gamble. Despite being critically acclaimed, Steven Speilberg’s Hook didn’t do the expected business at the box office, and it can often be hard for an audience to juxtapose the middle-aged version of the characters they love with the younger ones they grew up with. Here it falls to Ewan McGregor to portray the older Christopher, who, after boarding school, got married, fought in World War II, and eventually ended up working for a luggage company. It’s when he has been faced with the difficult task of cost-cutting at work, that Pooh re-enters his life. This isn’t on a par with the beloved A.A. Milne stories, nor with the animated offerings previously served up by Disney. The live-action Pooh loses some of his cuteness, and at times barely resembles the beloved honey-eating creature. McGregor gamely plays along, and gives a great performance, but the story itself is incredibly moralistic. They are trying to charm children, and shame parents who work too much, while also trying to reawaken the imaginative child in the adult audience. It never really seems quite sure which audience it is aimed at – grownups or LOs – and as a result it drags a lot. There is also a lot going on, making it difficult to focus on the crux of the story. Indeed, I would imagine some of the younger audience members would find all the business banter in the luggage factory rather tedious and confusing. The premise is very sweet, and there are some nice moments – particularly when McGregor gets to let his hair down, and play like a child in Hundred Acre Wood. But overall, this is bogged down by the weight of its good intentions. It has enough humour to engage an audience, and will definitely evoke some feelings of nostalgia, but a predictable ending and stereotyped characters do it a disservice. There are some lovely moments between McGregor and Pooh, and the other Hundred Acre Wood characters (Tigger, Eyeore et al) are good fun. But this is not as clever as it thinks, and at times, it is so saccharine it is cloying. There will be certain people who will absolutely love this, but for me it was just OK.
← Don’t Forget! Tomorrow – Galway Pride Club GASS Pride Spectacular At The Róisin Dubh Sat. August 18th!